---How do you pronounce Appalachia? Choose five people -- any five people -- and hand them a map with only the outlines of U.S. states. Ask them to draw a circle around "Appalachia," and no matter how well versed they are in geography, their maps will inevitably differ. Those five people can be from the same place anywhere in the country or even from the same family, but their definitions and their maps will differ. Why is this? In part it's because nowhere do the mountains follow state borders. Below are some other reasons we suggest, but what do you think? Local identities. Ask people anywhere in the region where they're from, and they'll probably say something like "Erwin (Tennessee)" or "Nicholas County (West Virginia)." They may say they live in or are from "the mountains," but they'll usually name a local or sometimes a sub-regional places like the part of a state. Outside perceptions. Because of those local identities, people who look at the region from elsewhere tend to use the term "Appalachia" more often and to see it as having a definite outline. This tendency means that, whatever they believe its boundaries are, they're more likely to view the region, its people, and its speech as homogeneous. In fact, one author has argued that the region was invented by outsiders: "Appalachia is a creature of the urban imagination" (Allen Batteau, The Invention of Appalachia, 1990, p. 1). Different criteria used. The two factors above imply that "Appalachia" is a cognitive region that people have in their heads (see the article below), so it's no mystery that they will draw it differently. Geographers have drawn numerous maps based on topography, socio-economic conditions, and all sorts of other things. We haven't found a map based on speech yet, but below we sample some others. Here's an article comparing the maps of Appalachia people have in their heads ("mental maps") based on whether they are native to the region or not. The findings indicate that the mental maps differ from the ARC designated area, but in regular ways. Ulack, Richard and Karl Raitz. 1981. 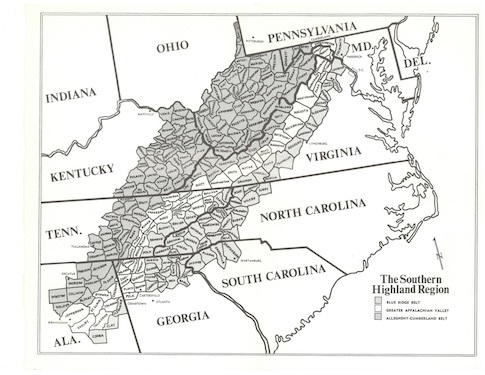 "Appalachia: A Comparison of the Cognitive and Appalachian Regional Commission Regions". Southeastern Geographer 21:1, pp. 40-53. 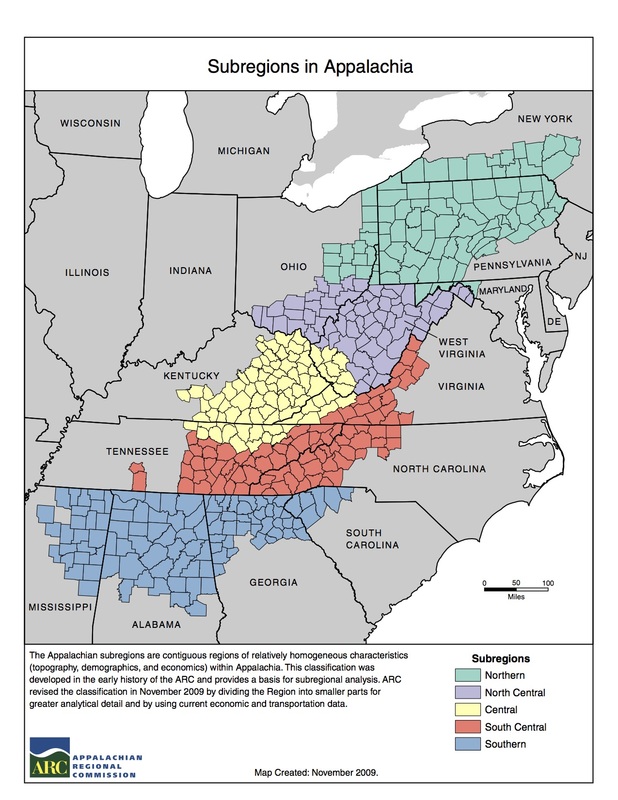 Here is the map that made Appalachia "official" (in fact, a map with 5 different subregions) for much of the country, especially the U.S. government, created by the Appalachian Regional Commission, a federal agency concerned primarily with economic development. It's based on a prototype from the late 1960s. 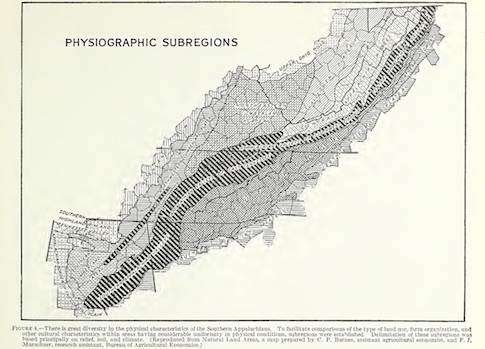 Another well-known (and one of the first) maps of the region, created by the Russell Sage Foundation, can be found in John C. Campbell's The Southern Highlander and His Homeland (1921). If you are interested in more maps, the 'Mapping Appalachia' project at Virginia Tech provides interactive tools and both historical and current maps in order to, in their words, provide tools for 'education and activism, facilitate discussion regarding the meaning of places, and to urge us to embrace the most useful and inclusive definition of Appalachia'.